MOSCOW, May 25. /TASS/. Shirking of full-scale investigation of the situations where nerve gas was used in Syria casts doubts over the ability of the Organization for the Prohibition of Chemical Weapons (OPCW), the Russian Foreign Ministry said in a comment on Thursday. "It looks like no one is in a hurry to go to Khan Sheykhun for verification of the details of a case as resounding as this one," it said. 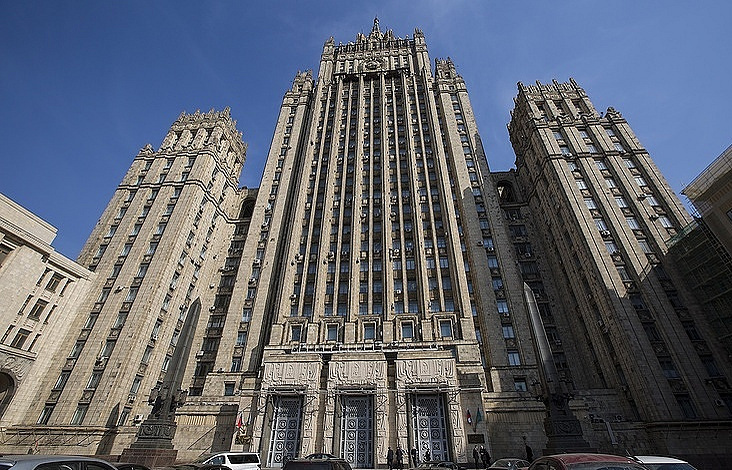 "It is really saddening that the the OPCW mission does not show activity in what concerns the establishing of cases of chemical weapons utilization, as it puts off a trip to Khan Sheykhun time and again, making references to unfavorable security conditions," the ministry said. "All the conditions have been created there in terms of security and compliance with obligations under the Convention," it said. Representatives of the US, the UK and France fiercely resist attempts to find out who indeed is behind a possible use of sarin in the Syrian Idlib province, it said. The ministry said that on May 23 the UN Security Council had another discussion on the situation around the so-called Syrian chemical dossier. The ministry said that on May 23, the UN Security Council had another discussion on the situation around the so-called Syrian chemical dossier. "The Western trio of permanent members of the Security Council sought to impart a marked anti-Assad and anti-Russian taint to the event," the ministry pointed. "It once again confirmed that the ‘denouncers’ of Damascus are not interested in establishing the truth in the issue as crucial as who stood behind the possible use of sarin in the Syrian province of Idlib on April 4," the ministry said. "Representatives of the US, UK and France fiercely resist attempts to find out how justified is their ‘in absentia’ verdict of an allegedly incontestable responsibility of the Bashar al-Assad’s government in that chemical attack in the settlement of Khan Sheikhoun," it said. The incident with the alleged use of chemical weapons in Khan Shaykhun in Idlib province took place on April 4. According to Russia’s Defense Ministry, the Syrian aircraft struck terrorists’ workshops producing chemical agents. Washington accused Damascus of using chemical weapons, after which the US Navy delivered a missile strike overnight to April 7 on a Syrian military aerodrome in the province of Homs.